Some things in life are just worth waiting for. Success. Baked goods. The right motorcycle jacket. The perfect pair of jeans. Other things. Sure, they’ve opened in a bunch of other cities before Chicago. But what places like Tokyo, Aspen and London gained in expediency, we’ve gained in former upscale corner grocery stores that are now places where you walk in and get more attractive as a result. Well, just the one. Anyway, you’re familiar with their insouciant, devil-may-care line of relaxed denim and their distressed-but-not-sloppy T-shirts. 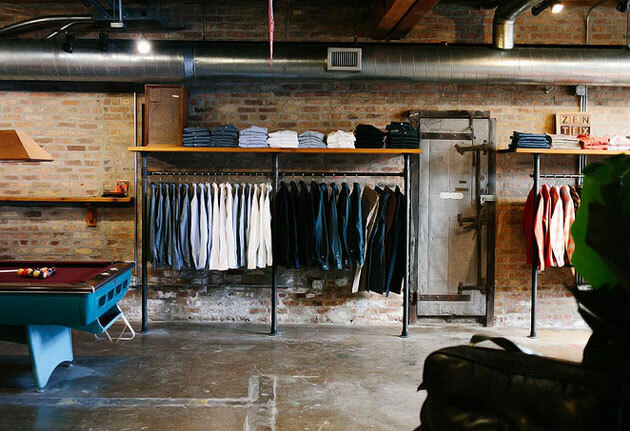 So your first stop is at the Standard Issue section, where those very pants, hoodies and supersoft cotton tees await. And if you’ll kindly direct your attention to the ready-to-wear collection in front of the checkout counter, that’s where you’ll procure things like leather Velcro shoes, unconstructed blazers suitable for casual dates and plenty of easygoing beach shorts and polos. Oh, and there’s also a shirt that looks suspiciously like a short-sleeve pajama top. You don’t have to wear that.